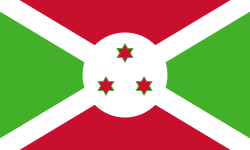 The flag of Burundi was created in 1967. It has a white diagonal cross divided the field into alternating red and green areas. The center of the cross merges into a white disk, on which there are three red solid six-pointed stars outlined in green. The ratio of the flag was 2:3 until 27 September 1982. The current ratio is 3:5. This page was last changed on 20 January 2018, at 21:54.